I enjoy making raw sauerkraut and I’ve gotten to the point where I make more than one batch at a time. This creates a problem: my hands are too sore kneading that much cabbage to create the juice for the raw sauerkraut. Kneading salt into the shredded cabbage is tedious and although it only takes about 10 minutes per batch, I would rather skip it. Here’s a method that is well known in the fermenting world that I tried that involves taking your cabbage, putting the salt on it, leaving it in the bowl with a weight and allowing it to sit for hours. You go about your day and come back and your cabbage will be soggy and ready to be put into jars. I use this recipe from Real Food Fermentation by Alex Lewin’s book (find book here) to create my raw sauerkraut. You can find the raw sauerkraut recipe here. For the raw sauerkraut recipe, skip the kneading part, insert the no knead method, and then continue with the recipe. Now I make 2 batches at once and it doesn’t leave my hands sore. 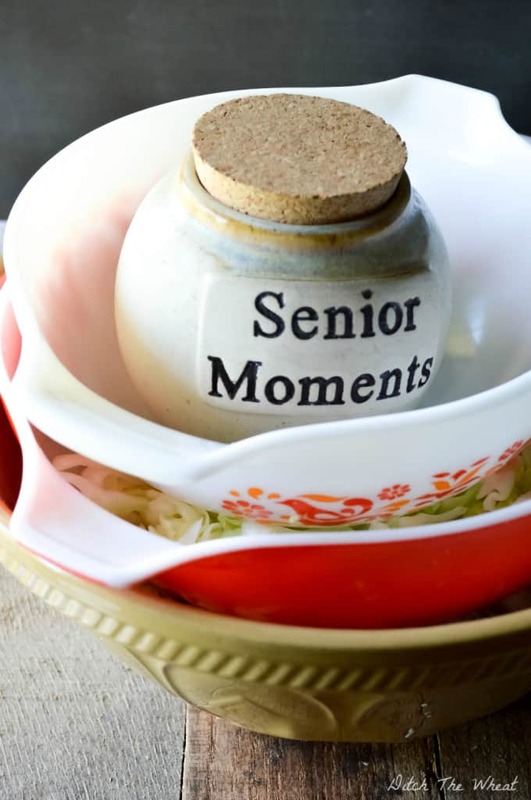 Since I make two batches I use 3 bowls, pile them on top of each other and use something heavy, in this case a “senior moments” jar. Slice the cabbage with a knife or mandolin. Place the cabbage in a bowl, sprinkle with salt. Place a heavy object on top and let it sit for a few hours. At the end of the day you will have cabbage that is ready to be stuffed into jars without the hard work of kneading. I found this book very helpful for learning how to ferment various foods. Real Food Fermentation (found here on Amazon) focuses on a beginners guide to fermenting vegetables, fruits, drinks and meat. If you want to learn more about how to ferment foods you should look into Nourished Kitchen’s course, Get Cultured. Click here for more information.